The Ontario government is praising the performance of their new HOV (high occupancy vehicle) lanes in Toronto (article). I hope that they are going well, it seems like a pretty good idea... the article referenced above even indicates that they'll expand the number of them, not only in Toronto, but in Ottawa as well. The only HOV lane in Ottawa that I can think of is on one of the bridges to Hull... if you've got 2 or more in your car you can take the HOV/bus lane there. Meg and I went out and purchased our first wee little Christmas tree this weekend. So the house is looking a little bit festive. That's certainly one of the things I've missed since living on my own, my mom's house was always decorated in early December. 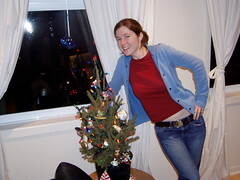 As you can see, the tree is certainly wee. We decided that due to a small set of decorations, and us not spending christmas at our place this year, that we'd only go small. But it's all rigged up with lights and decorations that I've received throughout my life. The coolest thing is that it's still alive... as you can see it's potted (and a wee bit crooked, I may have to correct that soon ;) so when we're done with it this season it'll go upstairs on the deck for awhile before being replanted somewhere. I hope you and yours have a splendid time this holiday season! Well, Kev and I are back at it, training for our long distance running endeavours... Okay, so Kev's are probably more endeavours, mine are certainly more in the struggle category. We're not necessarily training for the marathon this year, in fact, I'll only be running the half come Ottawa Race Weekend. But we'll be training as if it's the marathon I guess. My goal is to try to get to the point where I don't need to take breaks, and run the half straight through. Oh, and to see if I can lose some of this extra weight I've been carrying around for the last 10 years. Conservative's Clean Air Act Ridiculous! Arrgh, I'm furious after reading this Toronto Star article on the new legislation being tabled by the Conservatives for the environment. A goal by 2050 (44 years from now) of reducing emissions to be 45 to 65% less than todays. Wow... a whole 1% or so a year. You think we could do better. No regulation of industrial polluters for another 4 years. Gotta love the consultation phase. Intensity targets, what a farce. These don't put a cap on emissions but instead limit energy used per unit of production. How is that going to clean things up? Wow, I got quite a treat today courtesy of my girlfriend's roommate Adam Martin. Adam, you see, won a contest on the radio last week while I was in Minneapolis. 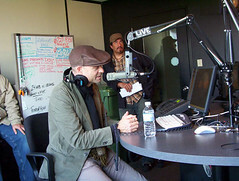 This contest allowed him to bring along a guest to be one of 6 people to watch a radio interview with the lead singer of the Tragically Hip, Gord Downie. With the bands next release, World Container, targeted for tomorrow we were treated to new CDs, autographs, a photo with Gord and a chance to watch and ask questions during the interview.